Traditional tracking-by-detection trackers may fail to track targets owing to interferences such as deformation, occlusion, fast or irregular motion, and background clutter. To improve the process of feature extraction, sample training, and the performance of the traditional kernelized correlation filter (KCF), this paper proposes a new joint multi-feature and scale-adaptive correlation filter tracking algorithm based on histogram of oriented gradients (HOG) and color-naming features. The new algorithm is composed of a position correlation filter tracker and a scale correlation filter tracker. It first uses a mask matrix to cut the training samples, obtains a higher proportion of real samples, and then trains the two correlation filter trackers. 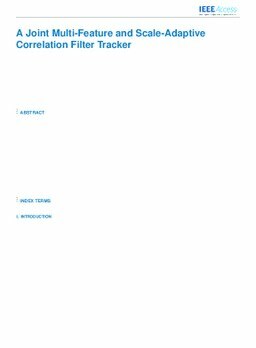 One is a position tracker that uses HOG and color-naming features to train two correlation filters, and then combines the results of the two correlation filters to calculate the target position. The second tracker is used to identify the scale with the maximum response size to select the target scale. The proposed algorithm achieves a competitive performance compared to algorithms such as KCF, compressive tracking (CT), and circulant structure kernel (CSK). The results show that this algorithm achieves a better performance when faced with occlusion, deformation, background clutter, and fast or irregular motion, and is able to track changes in target scale.